City slicker – the new compact Range Rover, shown here as the LRX concept, will come with 2wd. 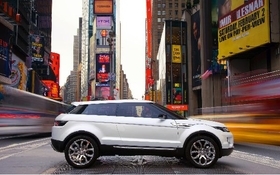 Land Rover's new "baby" SUV will be the British brand's first model offered with two-wheel as well as four-wheel drive. The new compact Range Rover will also be Land Rover's most fuel-efficient model when it goes on sale next year with CO2 emissions of 130 grams per kilometer, which translates into 5.5 liters per 100 kilometers or about 34 U.S. mpg. "A 2wd option is just one way in which we are developing our vehicles' efficiency while adding to the Land Rover range and expanding our customer base," Phil Popham, Land Rover managing director, said in a statement. The introduction of 2wd is part of a strategy to boost the fuel efficiency of the brand's SUVs. Another part of the plan is to launch the automaker's first diesel hybrid, which will be available to order in 2012 and on the road in 2013. 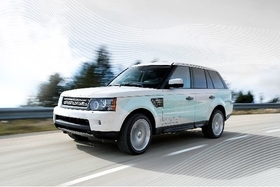 Later this year, Land Rover will begin testing the first diesel hybrid prototype called the "range_e." Land Rover's 'range-e' diesel hybrid. The prototype is being developed using a Range Rover Sport platform with a 3.0-liter diesel engine. The goal is to achieve a range of 34km (20 miles) using electric power and CO2 emissions of less than 100 g/km. Jaguar Land Rover is investing 800 million pounds ($1.15 billion) to develop new environmentally friendly technologies.